From keeping ahead from your competitors to gaining profits in the business, this is the only motto of every company in the world. Every industry has its own specific rules and regulations. In the import-export industry, one needs records and sources to stay for a long-term. Executing business of trading is not easy as one should have to need Trade Data Online. This source is an intelligence business report comprising of appropriate and updated shipping records regarding import and export movements took place in any country. Anyone can obtain this data report country-wise to know about any specific country’s trading business. This data includes comprehensive market information about the trading movements of international companies. This one is a helpful source for running the international trading transactions. Having actual records about shipments is an advantage in the trading business. Present records in Trade data Online represent everything about imported and exported products. It gives an overview of products which are generally export and import in international trading. The global data report also helps in finding the leading suppliers and importers of your goods in any foreign country. One of the main objectives is getting connectivity among global exporters and importers in order to enlarge the business all across the world. It is also considered as a market research tool for providing relevant, strategic, and consistent information on the import-export business. This is an immense database that has included shipping details such as product’s name, HS code, date of freight, destination port, country, mode of shipment and many more. 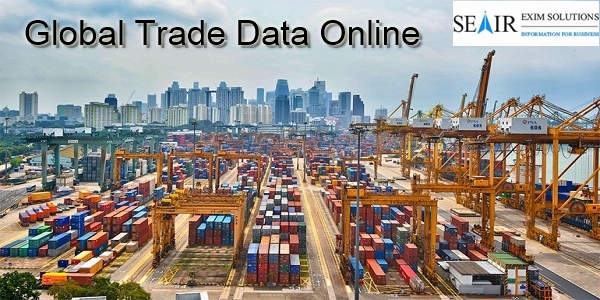 Trade data Online provide product wise information of both importers and exporters all around the globe. It is a customized and manageable report that will be accessed from anywhere. Fetching Global Trade Data is not a complex task nowadays due to data providing firms. Our SEAIR Exim Solution is one of those firms that have been offering data solutions and business information since 2009. This firm helps to take your business to the next level of success that you’ve wished for.